Q: On November 14, Premier Li Keqiang, when attending the 21st China-ASEAN Leaders' Meeting in Singapore, said that China stands ready to join hands with ASEAN countries to strive to conclude the negotiations on the Code of Conduct (COC) in the South China Sea within three years. What are China's considerations behind presenting such kind of a vision? A: Currently, thanks to the concerted efforts of China and ASEAN countries, the situation in the South China Sea has been stabilized and is improving. China and ASEAN countries have been comprehensively and effectively implementing the Declaration on the Conduct of Parties in the South China Sea (DOC) and actively promoting maritime practical cooperation. Important consensus and progress have been achieved on the consultations on the COC. In August this year, at the series of Foreign Ministers' Meetings on East Asia Cooperation, the foreign ministers from China and ASEAN countries announced that they have arrived at the single draft negotiating text of the COC. At this China-ASEAN Leaders' Meeting in Singapore, the leaders from 11 countries unanimously agreed to finish the first reading of the single draft negotiating text of the COC by 2019. At this meeting, the Chinese leader presented the vision that the consultations on the COC should be concluded within three years, which fully testifies to the sincerity, resolve and confidence of China to work with ASEAN countries to uphold peace and stability in the South China Sea. Concluding the COC based on the consensus through consultations at an early date is the shared aspiration of ASEAN countries as well as the sincere wish of the Chinese side. 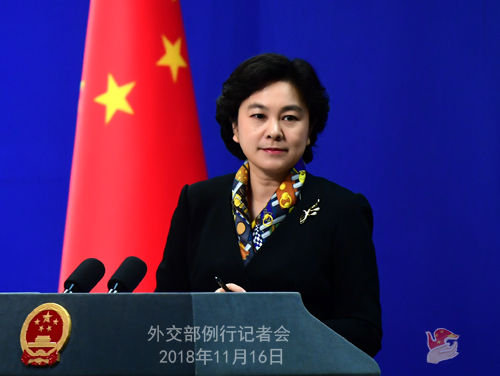 China is willing to work with all relevant parties to implement the consensus reached by the leaders, remove external disturbances, so that we can come to agreement on the rules that correspond with the realities and meet the needs of the region at an early date and uphold peace and stability in the South China Sea. Q: US Vice President Mike Pence said that the South China Sea doesn't belong to any one nation, and the US will continue to sail and fly wherever international law allows. Does China consider his remarks to be provocative? A: Recently certain people in the US have uttered all sorts of voices from time to time. We are all listening to them and also keeping an eye on their actions. On the issue of the South China Sea, we have said before that the freedom of navigation and overflight has never encountered any problem. We have asked the US side or those claiming that there are problems with the freedom of navigation in the South China Sea many times to produce a single piece of evidence to prove which ship or plane from which country has encountered problems when navigating or flying over the South China Sea at what time. However, up to now, no one can give us a clear-cut answer. This shows that the so-called issue of freedom of navigation and overflight in the South China Sea is a non-existent proposition. China's position is very clear. We are willing to join hands with the regional countries to firmly safeguard the true freedom of navigation and overflight enjoyed by all countries in accordance with the international law. Meanwhile, we firmly oppose undermining the sovereignty and security interests of the littoral states under the pretext of the freedom of navigation. Besides, may I ask you to remind the relevant person in the US that his country is yet to ratify the United Nations Convention on the Law of the Sea (UNCLOS). If the US could ratify and abide by the Convention at an early date, I believe that it would contribute more to peace and stability in the South China Sea. Q: It is reported that a bishop from Wenzhou, has gone missing for several days. Can you tell us anything about that and would that incident reflect some kind of setback in efforts to improve relations between China and the Vatican? A: I have not heard and am not aware of the specific case you mentioned. Regarding the China-Vatican relations you mentioned, we have stated our principled position many times. China and the Vatican have endeavored to improve ties. We are willing to continue to work with the Vatican to conduct constructive dialogue, enhance understanding, accumulate mutual trust and keep improving our relations. 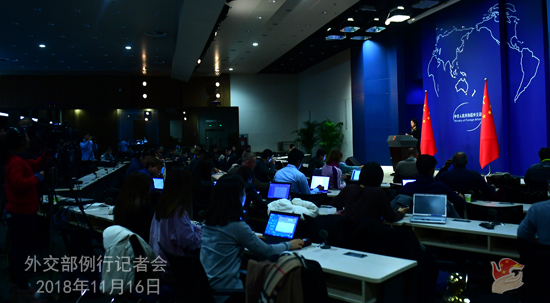 Q: Premier Li Keqiang announced at the China-ASEAN (10+1) Leaders' Meeting on November 14 that all domestic approvals for the upgrade of the China-ASEAN Free Trade Agreement were completed. How do you comment on the significance of this achievement? A: Since China and ASEAN established the Strategic Partnership 15 years ago, bilateral relations have grown from a fast-growing period to a maturing period featuring higher quality and now stand at a new stage of all-round development. Eight years ago, China and ASEAN officially set up the China-ASEAN Free Trade Zone which is the largest one for developing countries in the world, a decision which accords with the trend of economic globalization and has brought immense benefits to people in the region. China has been the largest trading partner for ASEAN for nine years running and ASEAN has been China's third largest trading partner for seven years running. Bilateral investment has exceeded 200 billion dollars. The upgrade of the China-ASEAN Free Trade Agreement (FTA) marks another major event for China-ASEAN relations and will surely further promote the economic and trade ties between the two sides and send out a positive signal to the international community of firmly upholding multilateralism and free trade on the part of China and ASEAN countries. Leaders of many ASEAN countries spoke highly of the successful upgrade of the China-ASEAN FTA. Philippine President Duterte said that ASEAN and China will continue to strengthen trade and investment cooperation and uphold multilateralism and the multilateral system, since this serves the common interests of China and ASEAN countries. Indonesian President Joko Widodo said that in face of the uncertainties of the international economy and challenges brought by surging protectionism and zero-sum game, ASEAN and China have no choice but to strengthen cooperation and make ASEAN and China important pillars of peace, security, stability and prosperity. Prime Minister Lee Hsien Loong of Singapore, the rotating chair of ASEAN, said that ASEAN and China all support rules-based and open multilateralism, greater openness and enhanced connectivity. The comprehensive implementation of the protocol on upgrading China-ASEAN FTA will send out a strong signal of supporting multilateral economy, trade and cooperation. I want to stress that China is committed to working with regional countries to advance regional economic integration and economic globalization. Now the international economic and trade cooperation is threatened by a surging tide of unilateralism and protectionism, but the general trend leading to regional economic integration and economic globalization has not changed. 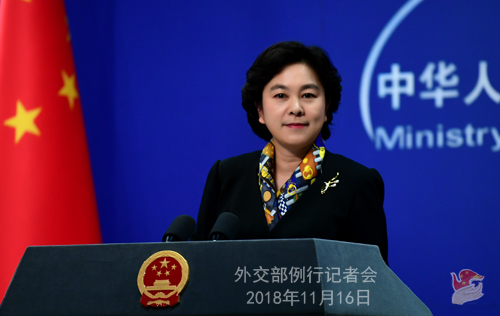 China will continue to take ASEAN as a priority of its neighborhood diplomacy and the official upgrading of China-ASEAN FTA as an opportunity to work with regional countries including ASEAN members in a bid to further promote regional trade and investment liberalization and facilitation and move forward East Asia economic integration. We will work with ASEAN to build a higher level of strategic cooperative relations, forge a closer China-ASEAN community with a shared future, and uphold the role of China-ASEAN cooperation as an important pillar of regional peace and prosperity. Q: Yesterday, Premier Li Keqiang met with Russian President Putin in Singapore. What is your comment on this meeting? A: We have issued the relevant readout on this meeting. You know that China and Russia enjoy the highest level of Comprehensive Strategic Partnership of Coordination. Leaders of the two sides have been in close communication and coordination in various ways, including through mutual visits and at multilateral meetings, to exchange views on bilateral relations and major international and regional issues of mutual interest. We speak highly of the current high-level performance of China-Russia relations and look forward to maintaining close coordination and cooperation with the Russian side whenever and wherever we can. Q: According to the Ministry of Commerce, the trade talks between China and the US have resumed. I was wondering if you have any reaction to this? And what are your expectations to these new talks? A: The spokesperson of China's Commerce Ministry has taken similar questions at yesterday's press conference. After the telephone conversation between the two heads of state on November 1, the high-level exchanges between China and the US in the economic and trade areas have resumed. Meanwhile, the economic teams from the two countries are in close contact on relevant issues. Q: There are reports that the DPRK has tested a new tactical weapon. Do you see this as a potential threat to the denuclearization process on the Korean Peninsula? A: I have just seen the relevant report and I am not aware of the specific situation. Just as we have noted, over a period of time, with the concerted efforts of all relevant parties, the situation on the Korean Peninsula has witnessed some positive changes. We hope that the positive momentum on the Peninsula can be sustained. Q: US Vice President Mike Pence said that there might be a new summit between President Donald Trump and DPRK leader Kim Jong Un next year. I wonder if China has any reaction to this? A: China always supports the contacts and dialogues between the DPRK and the US. Now the US and the DPRK are engaging in dialogue and remain in contact on implementing the consensus reached by their leaders at the summit. We hope that the high-level engagement between the US and the DPRK will help further ease the situation on the Korean Peninsula and move forward the political settlement process of the Korean Peninsula issue.